Die Mehrheit aller Seitenbetreiber verwenden mittlerweile Facebook Plugins um den Benutzern die Möglichkeit zu geben auch im Social Media mit den Webseiten zu interagieren. Die Studie von Gigya zeigt nun die Einflüsse von Facebook Plugins auf das Benutzerverhalten. The results clearly show that on-site social technology brings real value to sites. 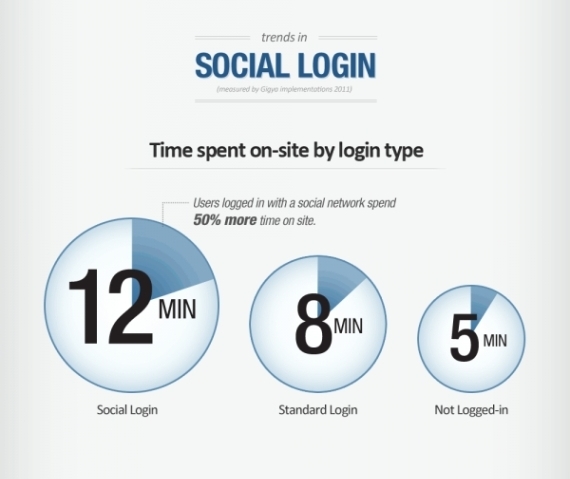 Perhaps most notably, we can see that social login and social plugins are correlated with major increases in time spent on-site and page views. The biggest increases in time spent and engagement are seen when users leverage social login and interact with our Comments plugin allowing them to share opinions on content and interact with other users – including those from their social graph – on-site. From these points alone, it’s fairly easy to conclude that users want to be social wherever they go across the web. Diving a bit deeper, it seems that when a person logs into a site with social login, they’re doing so because they want to interact with the site and with their social graph, resulting in the same benefits of increased time spent and page views that social networks enjoy. In essence, social login is acting as a gateway for user engagement with plugins like Comments, Sharing, Game Mechanics and Activity Feed. For example, on the Pepsi SoundOff site (a Gigya client), the first step to interacting with the site and with other users is to log in socially. When that connection is made, users can instantly participate in all of the site’s social activities like commenting, sharing and earning points/rewards.